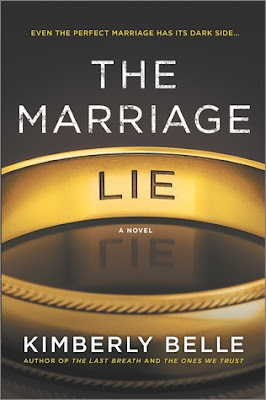 I started The Marriage Lie by Kimberly Belle one morning and didn't put it down until I finished it. This book is a definite page-turner and the reader doesn't know what the truth is until the very last pages. It's full of fantastic characters and believable situations that just keep you guessing. Iris and Will have been married for 7 years and are still very much in love and planning to start a family. Iris's world falls out from under her when Will is killed in an airplane crash but this is when the mystery starts. Will was supposed to be on a plane going to Florida for a conference but he was killed in a plane crash of a flight going to Seattle. Iris is grief stricken and confused and knows that someone somewhere made a mistake and Will isn't really dead. As the days pass and there is no word from Will, she has to accept his death but then she begins questioning WHY he was on a flight to Seattle and what else he had been hiding from her during their marriage. As she tries to find out answers, she is beginning to wonder who the man she loved really was! The Marriage Lie is written so well that it will keep you rapidly turning pages to try to get the answers you need. The characters are so well done, that I felt the pain the Iris was feeling in her grief for Will. Add The Marriage Lie to your reading list - it's a book you definitely need to read and one that you will enjoy immensely.